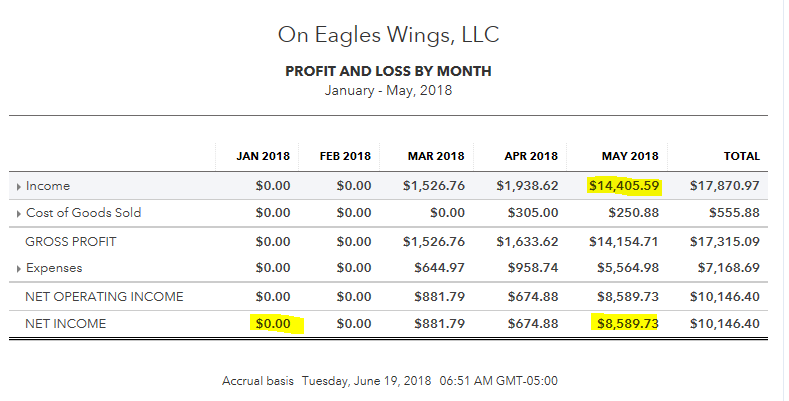 The Profit and Loss report by month is an insightful report that sheds insight on monthly income or losses. As as small business owner, this report can help you understand which month was your highest net income month. It also can report which month had the greatest expenses. Knowing your income by month will help you create budgets and have a greater clarity of how your business operates in a yearly cycle. You may wish to collapse the report details by clicking the arrows next to Income, Cost of Goods Sold, and Expenses.